the Right Worshipful, the Mayor of the City of Derby, Councillor John Whitby. In his welcome statement, the Mayor spoke of the significance of the hour, and stressed the importance of remembering such tragedies in order to ensure they are not repeated, not forgetting to mention the Armenian Genocide amongst the roll call of Genocides. 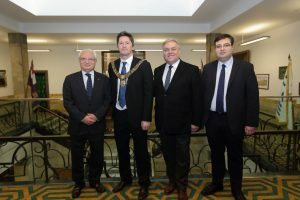 The deputation thanked the Mayor and the Holocaust Memorial Day organisers for the invitation, and for the opportunity for them to discuss with the Mayor the tragedy which befell the Armenian nation in the dying days of the Ottoman Empire. As a token of appreciation, the Mayor was presented with the official commemorative pin of the 100th anniversary of the Armenian Genocide.